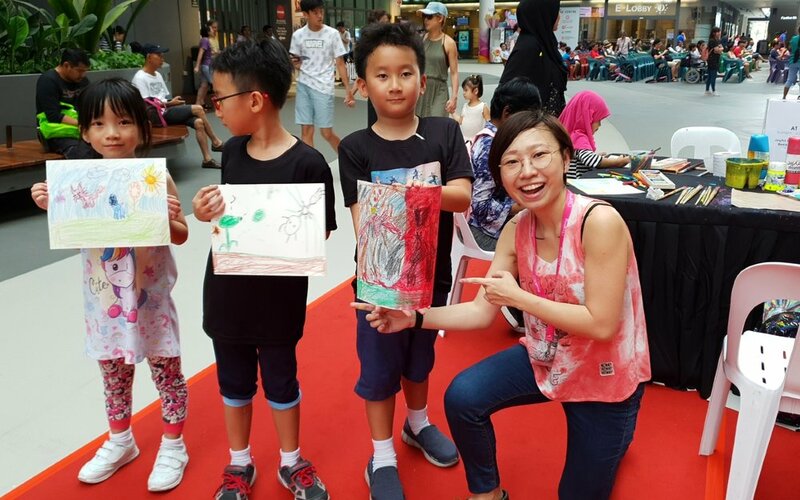 We got to bring some joy and colours to the community through a series of arts and craft activities at Our Tampines Hub. Really enjoyed myself working with the other artists, volunteers and clients of Singapore Association of Mental Health. For my session, I did a resist painting workshop and opened it to everyone - from adults, to children, to families and the elderly. It was pretty cool seeing all the artworks come to life! It was a walk-in workshop, so I had a constant stream of people filling the seats at my booth. The table was a whirlwind of people, activity and colours! Check out the smiles on these proud participants! I’m so glad everyone had such a good time. Thank you to the SAMH team and PAssionArts at Tampines 淡滨尼百盛艺术 for putting this meaningful event together, and having me play a part in it! Edit: Also, this event got some press on The New Paper!